I am a Florida girl so I get cold really easily, and I love a soft blanket to help keep me warm. 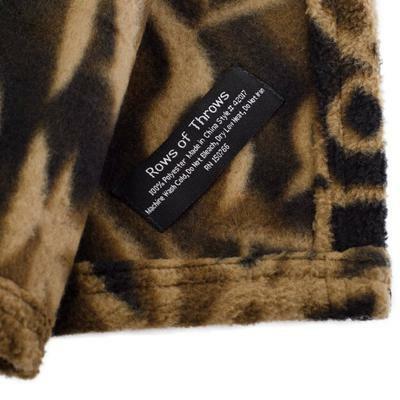 So when Rows of Throws told me about their fleece blankets with horse designs and asked me if I wanted to feature them on the site, of course I said yes! They sent me one to try and I fell in love. It's super soft and the double-sided design features an adorable buckskin pony with the sweetest face. I think the artwork is really well done and would look awesome in an equestrian-themed room! The throw is also extremely large (63" x 73") as well, making it even more comfortable and perfect for chilly nights. In fact, I am curled up in mine as I am writing this! Plus, it comes beautifully packaged in a pretty brown satin bow, if you want to give it as a gift. I am sure a horsecrazy girl of any age would love to get one of these as a birthday or holiday present. Get this beautiful blanket on Amazon here. I just love all these great comments! Thank you so much for sharing your thoughts and thanks for the feedback on the contest - I love doing them. To the California girl who is in school in NY - I am looking at schools up north and I know I'll freeze to death. I think I will need ten of these ha! I'll be picking winner soon so stay tuned. This blanket is beautiful! It would definitely keep me warm during those cold winter days! So pretty! The person who wins this will be lucky. :) Where could I order a couple for gifts (if I don't happen to win one? lol :) Thanks! This blanket looks amazing! I am always cold and am currently in a college dorm room with only a comforter and a sheet on my bed. I do not have my own fuzzy blanket to cuddle with when I watch movies or study. This would be so perfect and would satisfy me by keeping me warm and providing me with another horse item! I would love to get this blanket for my daughter. She loves horses. She has a social anxiety and being around horses or anything to do with horses seems to bring her peace of mind. So this would be an awesome gift to win for her. I would love to have a horse blankets like this for my room! I would love to have this blanket!! That would be absolutely amazing! Sydney, I'm so glad you do these kind of things! It's so fun!! I am always so cold so I would adore this! Exciting! They look so warm and cozy! Hope I win it for my Horse-crazy little sis! Oh my! That is such a beautiful blanket. I love throws so much especially because I live in Canada so it gets really cold. This is such a gorgeous horse throw!